Lexsson Posture Corrector Brace is designed to improve your overall body posture for a healthier version of you! You no longer have to accept bad posture or the "desk worker" slouch as a way of life since you can wear our orthopedic correcting device and see significant improvements in your spine, neck and shoulder alignment. Our brace is developed to straighten out your spine and correct shoulder alignment to relieve pain in the lower and upper back. Whether you suffer from scoliosis, kyphosis or other spinal or muscular conditions, our device can help you get back to a life without pain or discomfort when worn for just a few hours each day. Most people use a posture device to aid in pain relief or improve slouching, so why would you purchase a brace made of uncomfortable materials? Lexsson knew our users would be searching for comfort, which is why we created our braces using soft, stretchy neoprene and added extra padding along the straps for a longer comfort wear. You shouldn't have to wrench or twist your back to put on a brace designed to improve pain and posture! That's why we formulated our brace with extra long, easy velcro straps so you don't have to struggle or hurt yourself further to use our device. Our adjustable brace is designed for chest circumferences from 28 inches to 48 inches, so make sure to measure before adding to cart. Our unisex clavicle support brace is intended for both men and women, because we could all have better posture! And, you can wear this while seated at your desk, at home, or while working out. And, with our satisfaction guarantee, if you are not completely satisfied with your purchase, we will refund you, no questions asked. If you have any questions about this product by LEXSSON, contact us by completing and submitting the form below. If you are looking for a specif part number, please include it with your message. 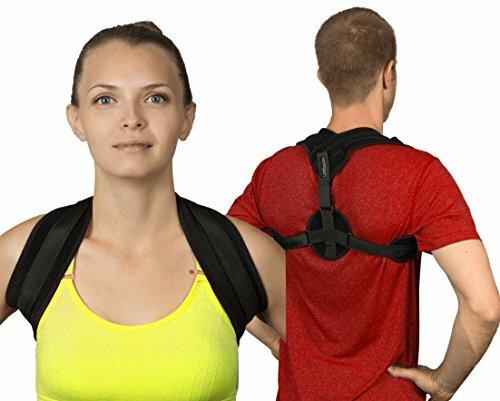 Adjustable Posture Corrector by Vertebra - Discreet under clothes design for women and men - Upper Back Brace helps support and correct posture to relieve neck and back pain.